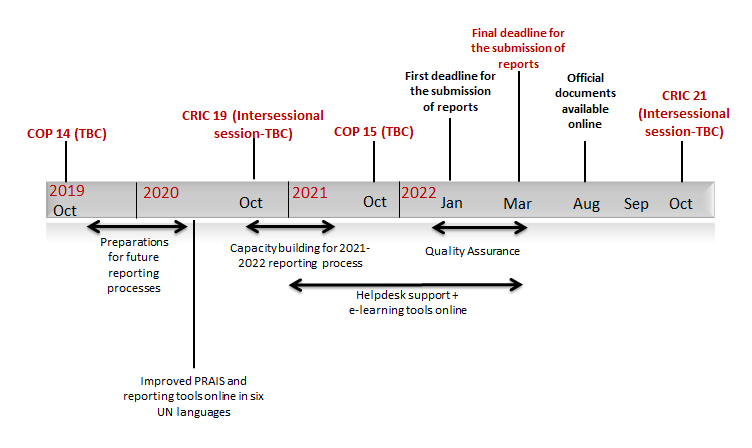 The 2017-2018 UNCCD reporting process - the first reporting process under the UNCCD 2018-2030 Strategic Framework - officially concluded on 31 August 2018. In total, 141 reports out of 196 were submitted, of which 138 provided data suitable for the preliminary analyses. Forty-eight reports (or 88 per cent of the expected reports) were from Africa; 36 (or 65 per cent) from Asia; 27 (or 82 per cent) from Latin America and the Caribbean; 9 (or 75 per cent) from Northern Mediterranean countries; and 12 (or 80 per cent) from Central and Eastern European countries, as well as 8 (or 29 per cent) from Parties that do not belong to a regional implementation annex. Important to note: Submission of reports is still possible, and Parties which have not yet submitted their reports are strongly encouraged to do so. The first preliminary analysis of information deriving from reports submitted by the deadline were discussed during the seventeenth session of the Committee for the Review of the Implementation of the convention (CRIC 17) hosted by the Government of the Co-operative Republic of Guyana in January 2019. The preliminary analysis documents are available for downloading here. The final report of CRIC 17 which contains conclusions and recommendations from the reporting process will be presented later in the year during CRIC 18. The document is currently being finalized and will soon be available for downloading. The CRIC 17 final report will serve as the basis for draft decisions for consideration by COP 14 which will be hosted by India in the fall of 2019. Going forward, and as per the decision of Parties at COP 13, the reporting cycle will be every four years instead of every two years.